I’m what you might call a quote-a-holic. Actually, you probably wouldn’t because you’re obviously way cooler than me and wouldn’t use terms like that. But I really, really, REALLY love quotes. My obsession started back in elementary school when chain emails were a big thing. I actually have a few funny ones saved on my computer still, but the majority were cheesy poems that you had to forward to everyone you loved to remind them that you care. And when you were twelve in the early 2000’s, it was very serious business. 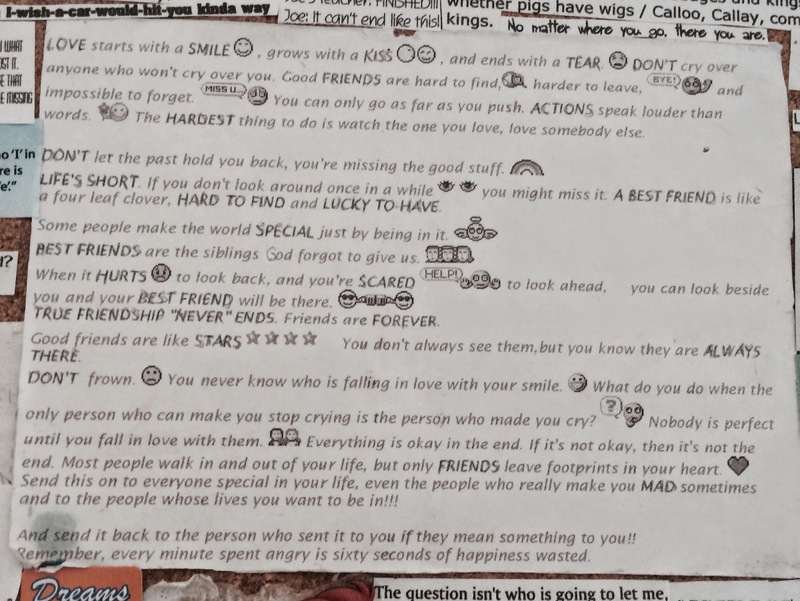 Anyway, I received one (and I honestly couldn’t tell you who sent it to me) but instead of the usual cheesy poem it was a bunch of (equally cheesy) short sayings punctuated with emoticons illustrating each saying. And a monster was created. I printed out the group of sayings on my dad’s old black and white printer and pinned it on the little half cork board and half white board that I had in my room. And thus, my new quote obsession spawned my first quote board. These quotes also found their way into my msn messenger screen names more than once. I had just finished a book report for school and part of the assignment was to include a quote from the book. In grade seven if was that annoying overachiever/ goody good/ teachers pet and of course just one quote wouldn’t suffice. So there were three. And after getting my book report back, I cut up the part with the quotes and that went on the quote board as well. Then, one of my first online loves was discovered: http://www.firehotquotes.com (It still exists!). I spent countless hours copying and pasting quotes from and into word documents. I then found quotes from digimon, and at the time I was hiding my obsession in order to appear ‘cool’ so I altered some of the quotes to be un-digified. The collection grew and grew and I began cutting and pasting all these quotes onto my little bulitin board. And then upgraded to a full size bulitin board. And another. And another. Then I decided the quotes were too spaced out and older quotes were too separate from newer quotes and I wanted there to be more variety on each board as well as an optimal use of space. If you can’t tell, I take the weirdest things very seriously. 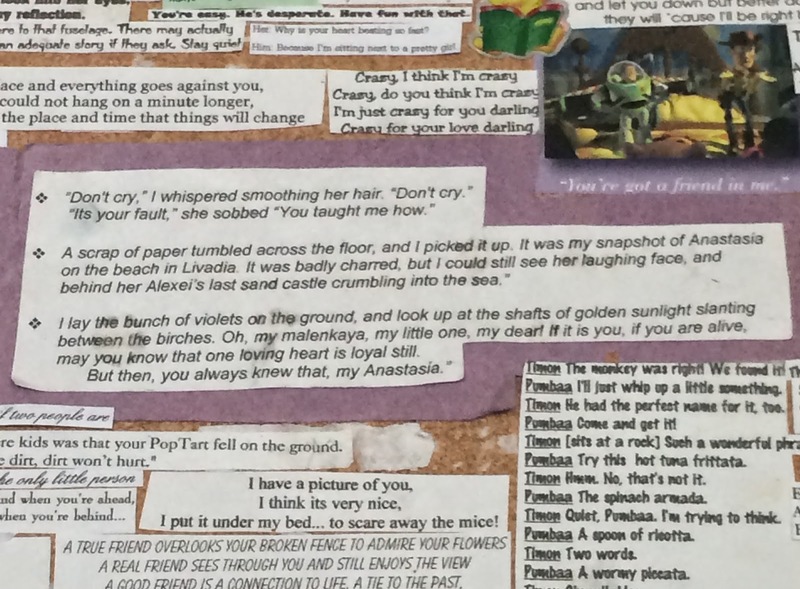 So, an entire summer was spent taking off all the quotes that had been held on with sticky tack, and reapplying them with glue and leaving as little space between them all as possible. I got really good at Tetris that year. Now, I have nine quote boards. They have travelled with me from old house to new house, some to four different bedrooms and multiple room reorganizations. Each one has some kind of mini tribute to Canada as well as random things, pictures and of course… So many quotes. Of all the things I own and have made, my quote boards are the most special to me. It was something I came up with all on my own and they grew and evolved with me. Yes there are the cheesy quotes I found when I was twelve, and the digi-sensored ones as well as the later added actual digimon quotes. They are still incomplete and I have a drawer of ‘to be pasted’ quotes as well as a document of ‘to be printed’ ones. 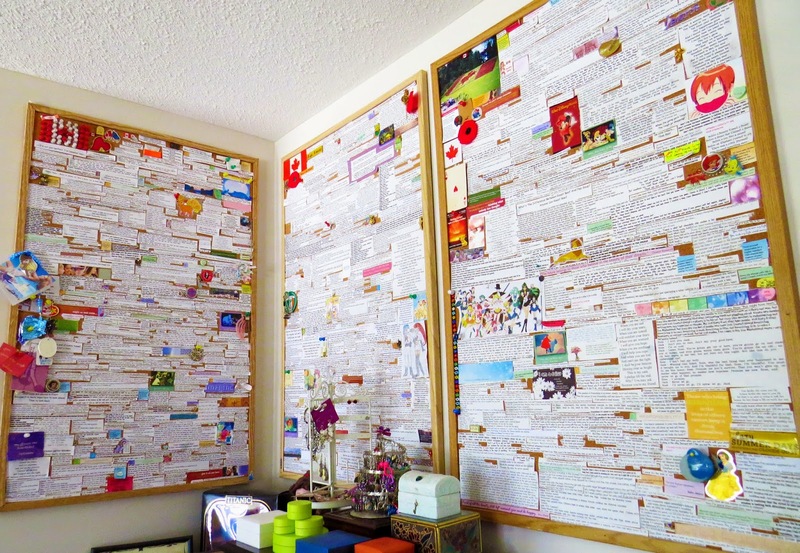 After ten years of an obsession I have over a thousand pages worth of quote related word documents and have depleted Canada’s supply of sticky tack and glue sticks. There are very few things I treasure to the same standards as these boards and I’m only half joking when I tell my mom that they can’t go into storage because they’re going with me to every room I ever occupy, including my grave. They can be cremated with me, right? Previous Post Impressed with ImPress?